Thanks to contribution from BCcampus, users can format media attributions in an automated, standardized way by enabling the Media Attributions setting in their theme options. 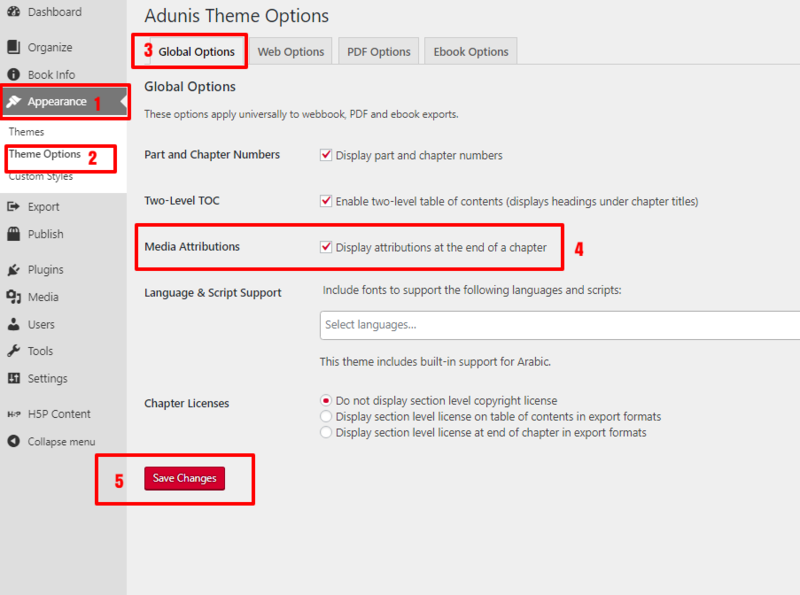 With the Media Attributions setting on, you can display the attribution metadata of your media files at the end of each chapter of your book. This is helpful for users who, for example, are creating textbooks and may be using a large quantity of images from different sources. This setting allows attribution information to be displayed at the end of each chapter after your body text and before your footnotes. Now, you can add your attribution information to each image in your media library. There are two places where you could choose to input your attribution data. If you upload your media to your media library before placing the image in a chapter, or if you’re entering attribution data for images that you’ve already placed throughout your book, it’s best to edit image attribution data in the Media Library page. Find your book’s Media Library by going to Media > Library from the left-hand menu of your book’s dashboard. Follow these steps for each image that you’d like attribution information included in your book for. Once the file is uploaded, you’ll be redirected to Media Library screen in the dialog box. Repeat this process for each new image you insert. Media Attributions by admin is licensed under a Creative Commons Attribution 4.0 International License, except where otherwise noted.